Stop looking behind you… Start looking forward! 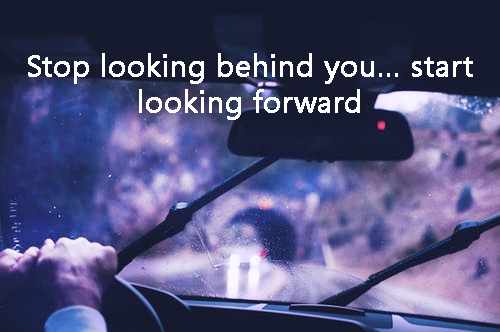 Are you driving while looking out your rear-view mirror? The reason the rear-view mirror in your car is so small compared to the windshield is because we are taught to drive while looking ahead, not behind. While it is helpful to gaze briefly in the rear-view mirror to see where you have been or who is following you, it is dangerous to keep your attention there. Imagine if all of us drove while only looking in the rear-view mirror. No one would get where they wanted to go and we would leave carnage in our paths. Life also is unproductive and dangerous if we don’t look ahead. We don’t get anywhere and leave all kinds of damage in our wake when we focus on the past. Everyone seems to know this, but so many of us focus our attention on where we have been and what is already behind us, rather on what is ahead. It seems far too tempting to keep our eyes on the rear-view mirror when it comes to life. If you are in the habit of focusing on what is holding you back, stop before you hurt yourself or someone else! Our past haunts us and possess the power to hold the even the best of us back. We all have scars, limitations, and adverse circumstances that encumber our lives. Certainly, some people have faced more difficulties than others. However, it is not the degree of our limitations that holds us back as much as it is the attention we give it! If we focus harder on our problems than we do our goals, we inevitably will fail to reach our potential. Have you been focusing harder on where you have been or where you are going? People focus on their problems because it is easy to complain about their circumstances and make excuses for their unhappiness. Realize, if you are focusing on your problems you don’t have big enough goals! Setting meaningful goals helps you get through circumstances, around obstacles, and over the hurdles you face. Focusing on your goals keeps your attention where it needs to be. If you fail to focus on your goals you risk not getting what you want out of life. Failure to focus on your goals is the fastest way to mediocrity or worse. An unfocused mind will put its host on a collision course with an unhappy life. If you are unhappy or in a bad place, try using your goals to get yourself up and out! Do you have goals? Are your goals written down? Are your goals lofty and inspiring? Goals allow us to live in anticipation of what is to come. It is the pursuit of these noble things that gives us hope and leads to a happier life. For years I kept my goals written and posted above my toilet so I would see them every morning and every night. Every new year I started with eight written goals, four business and four personals. My first and most important goal was always my yearly savings goal. I knew if I saved properly that financial independence would allow me to spend my time and money the way I wanted. The goals were lofty and increased every year as I gained in success. Your goals should be big and get you excited to jump out of bed every day and giddy-up that hill. Your goals must be exhilarating enough to make you forget about the past. Your goals can be sweet enough that even the thought them gives you the strength and determination to bust through life’s obstacles. Issues from our past and adverse circumstances should be expected. But like the rear-view mirror, problems become small when we look through the windshield and focus on the opportunity in front of us!